Brother-sister duo, legendary superstars Donny and Marie Osmond brought their hit show all the way from Flamingo Hotel in Las Vegas to the historic Paramount Theatre in Aurora, Ill for seven sensational performances August 27th-31st, 2014. Voted “Best Show in Las Vegas” for three consecutive years, this one of a kind concert experience offered concertgoers state of the art lighting, state of the art video production, a full band, breathtaking costume changes, lots of humor and audience participation. Performing everything from pop, country, rock & roll to opera, Broadway tunes, American standards and more, Donny and Marie left the audience speechless and awed by their ability to sing all genres of music. 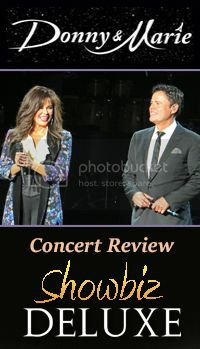 Having respective careers in the business as both solo artists and as a duo, Donny and Marie effortlessly breezed through many of the hits from their illustrious careers such as “Puppy Love,” “Soldier Of Love,” “Deep Purple” “Paper Roses,” “Meet Me in Montana” and “There’s No Stopping Your Heart.” Their show-stopping medley of hits had the audience begging for more! Out of all the acts in show business, both current and established, Donny and Marie are two of the finest entertainers by far; they are well rounded performers who are physically fit, vocally primed and never fail to deliver comical punch lines toward each other. Working every inch of the stage with style and class, Donny and Marie have managed to uphold their standing as America’s beloved duo through the years. In closing, this magical 2 ½ hour concert was worth EVERY cent. New fans were made, both young and old while dedicated die-hards were taken on a bittersweet trip down memory lane. We would like to thank the Paramount Theatre for bringing top-notch entertainment to the Chicago land area. We only hope that this very special concert will become a yearly tradition!